Ceilings Plates are used to secure threaded rod to a wooden ceiling. Used in combination with threaded rod to support pipe, strut channels or equipment. The 941-012-EG from PHD is a 1/2” Galvanized Ceiling Plate. 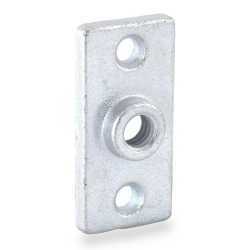 It secures a standard 1/2" threaded rod .. The 946-038-CP from PHD is a 3/8” Copper Coated Ceiling Plate. It secures a standard 1/2" threaded r..